You see those chaps in that image up there? They are riding Deathstalker Scorpions. Pretty vicious looking mount that, eh? Bet you want one for yourself. You could straddle its great big hard body and scuttle into battle, pincers snapping and tail ready to stab venom into anything that gets in your way. What a way to win a war. Let’s just say you do want to ride a Deathstalker Scorpion into battle, how might you go about doing that? 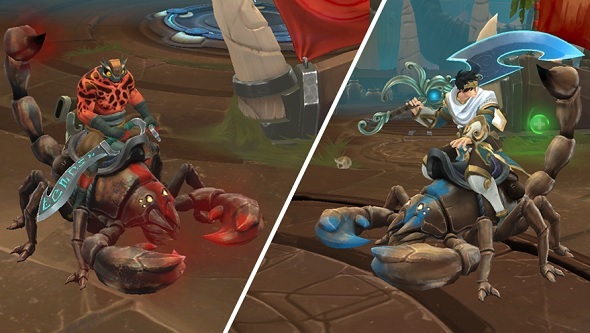 Short of throwing nuclear waste at a real scorpion then spending years taming it, you could start playing team arena brawler Battlerite and grab your own. Oh, but it’s not quite that simple, my fellow. You see, not any old fool is able to ride a Deathstalker Scorpion – it takes guts, and more pertinently, a quick finger. You see, we’re giving away 5000 codes for Battlerite that each contain a free Deathstalker Scorpion mount. If you want one then you’ll have to be fast in order to grab one below. You see that widget down there? That’s where you can get your code. All you need to do is complete one of the available actions and you should receive your Steam key. Go on then, don’t hang about – they’re only available on a first come, first serverd basis. Oh, and one more thing, the codes will only work in the following regions:USA, Europe, Russia, Japan, India, South Africa, Hong Kong, Australia, Singapore, Brazil, Chile, and Peru. Now then, if you have your code but don’t know how to redeem it on Steam, just follow the instructions below.